Find out what to expect from our lawn treatment programs. Receive free service calls with all of our Atlanta lawn care programs. Choose from one of our five Atlanta lawn care options – Silver, Silver Plus, Gold, Gold Plus or Platinum. The lawn care program consists of seven treatments throughout the year to control weeds and make your lawn greener, healthier and thicker. Each treatment plan is custom designed for your landscape. If you see a problem with your lawn, just call us and we’ll come to your property to check it out. Brown patch and dollar spot are common, easily identified fungal diseases here in Georgia. We’ll will treat your lawn with a fungicide every 21 to 28 days during the warm season (April – September) so these don’t become a problem for you. Nutsedge is a weed that resembles grass. Our treatment minimizes nutsedge substantially, and just three applications of our product will guarantee nutsedge control for the next season. Clump grass treatment is for properties that have a different type of grass growing within their primary grass, such as fescue growing in Bermuda grass. Three applications of our product will guarantee control for the season. Our ornamental tree and shrub program consists of seven treatments throughout the year to protect them from insect damage and disease, make them more resistant to drought, and give them a better look and stronger color. We also can take care of your pruning or tree removal needs. Aaahhh, summer! In Georgia, that means grilling, swimming, ants, ticks, fleas and all kinds of nasty pests. While the above fleas and ticks or fire ant applications take care of those insects specifically, our Outdoor Pest Control takes care of many types of bugs and insects. We’ll spray a barrier around your house to keep ants, ticks, fleas and spiders at bay. In addition, we spray other areas in your yard where pests tend to breed, like in mulched areas, at the base of the shrubs and on ground cover. Free with our Gold, Gold Plus and Platinum Programs. Aeration removes plugs of soil, allowing water, nutrients and air to get down to the roots. The result will be a thicker, healthier lawn. While Bermuda and Zoysia grasses will particularly benefit from aeration, all turf types can thrive as a result of this service. We recommend this service for fescue lawns only. It is done from September through November. “Overseeding” is laying seed down over the existing lawn to help it grow thicker. We use a single application of TopChoice™ by Bayer for 12-month control of fire ants. Also has a short-term 30-day control on nuisance ants, fleas and ticks. If your lawn had grub damage last year, it has an 80% chance of being damaged by grubs again.This preventative gets applied twice during the summer months to combat army worms and grubs in your soil. It has a 60-day residual effect after application. The first treatment is applied in June to help prevent army worms. The second treatment is applied in August to help prevent grubs. This treatment can be applied to all lawn types. This preventative has little impact on beneficial insects and others you do want in your yard such as earthworms. The Mosquito program consists of six treatments applied once every 30 days from May through October to help minimize the activity of mosquitoes in your yard. The treatment also includes the placement of a larvicide to help keep eggs from developing into larvae. Available as an addition to the Silver, Silver Plus, Gold, Gold Plus or Platinum Programs. *A credit card is required for this program and payment will automatically be deducted monthly. We reserve the right to modify any of our Atlanta lawn service treatments should the weather require it. Our highly skilled Certified Landscape Specialists, and the quality products we use, get results. Happy yards all over the Atlanta area -- and their gnomes -- are the proof. So we can confidently guarantee that, if you sign up for one of our programs and follow our maintenance and watering recommendations, you’ll have a healthier, more attractive yard. If you aren’t pleased with the outcome of the service we provide, we will re-evaluate and re-treat as necessary, at no additional cost to you. If you still aren’t satisfied with your yard, we will gladly refund the cost of your last treatment. Gnomes love lying in the lushest, greenest, most luxuriant yards. What do they love even more? Enjoying those yards under shady trees that are free of bugs and diseases. While we at Arbor-Nomics Turf protect your ornamental trees and shrubs from funguses and insects, Arbor-Nomics Tree specializes in all native Georgia trees and shrubs, and the best ways to keep them healthy. While they’re working to safeguard your native trees from the threats that target them, they’ll also keep your ornamental trees and shrubs pruned, and even remove them for you. 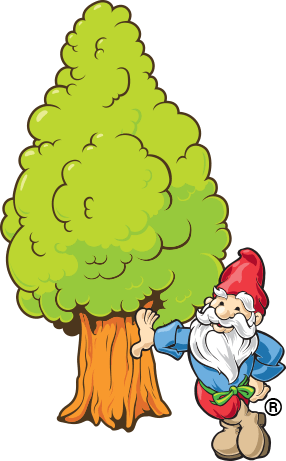 Click Here for more information about Arbor-Nomics Tree.